Although certainly not obligatory, graded exams can provide a structured programme of study through which your child can progress and develop on their chosen musical instrument. We believe that this experience should be positive, rewarding and enjoyable and are aware that these exams are not suitable for all pupils. For those pupils whom we feel would benefit from and enjoy the exam system we recommend the syllabuses of the London College of Music, the Registry of Guitar Tutors and RockSchool, although pupils are also sometimes entered for the more traditional exams of the Associated Board of the Royal Schools of Music when appropriate. The syllabuses of LCM, the Registry and RockSchool are particularly sympathetic to the styles and repertoire of contemporary instruments such as keyboard, guitar and drum kit, allowing considerable scope for creativity. Exam sessions are held three times a year; spring, summer and autumn. We’ll write to you if, and when, the teacher feels your child is ready to sit an exam. There are are costs involved and therefore these exams are discretionary. 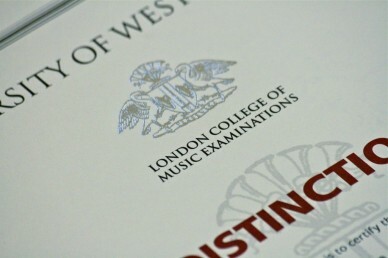 Music exams are graded from 1 through to 8 and are available on most instruments. Some instruments offer ‘pre-grade’ exams, such as the Electronic Keyboard ‘step 1’ and ‘step 2’ exams, which are offered through LCM’s syllabus. Most exam boards also offer various diplomas which succeed grade 8. A ‘goal’ to aim for. All pupils benefit from a target or goal to aim for, and each grade sets out new skills and techniques for your child to conquer. These hurdles help them to develop and improve on their chosen instrument. The exam system is certainly a handy tool in helping encourage your child to sustain regular practice. It’s extremely satisfying when you see the delight on a child’s face as you tell them that they’ve passed their exam, and even more enjoyable to inform them that they’ve gained a ‘distinction’. All successful applicants receive a very attractive, professional looking certificate and most exam boards are now ‘accredited’, with grades 6 and above earning UCAS points.